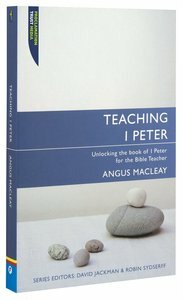 About "Teaching 1 Peter (Proclamation Trust's "Preaching The Bible" Series)"
Angus Macleay is the minister of St. Nicholas, a large Anglican Church in Sevenoaks, and is also a member of the Church of England General Synod. One of St. Nicholas previous ministers was the poet, John Donne. The recent story of the church is told by the book The Church that went under.